New project for a new year. Let me introduce the Tombstone Carryon Sling Pack. 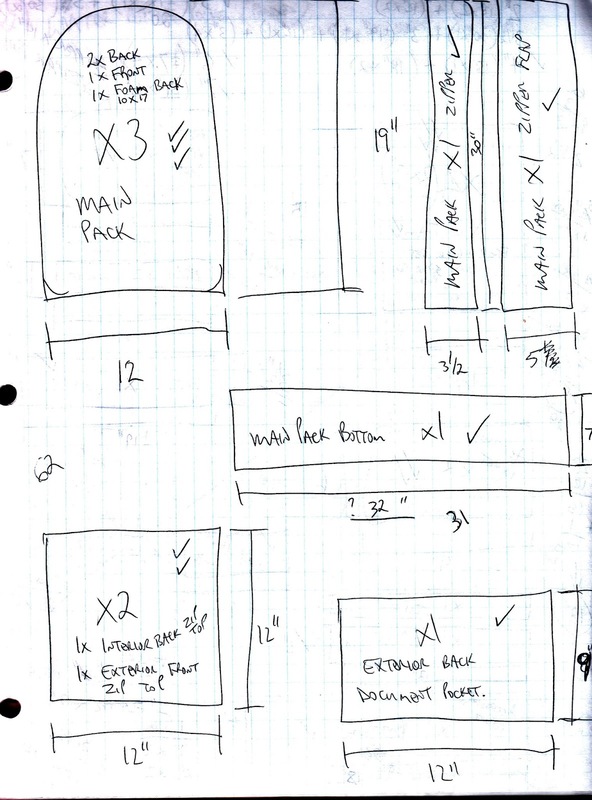 In part one we will discuss the idea, the layout and the progress to date. 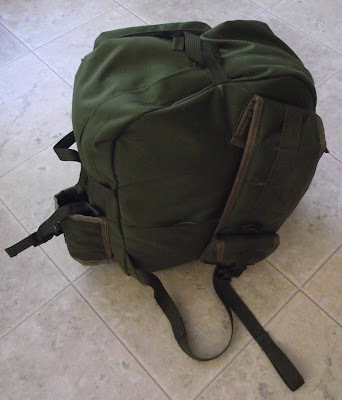 A carry-on bag was needed around here. One that would meet specific needs. The bag had to be sized to meet current carry-on limits for overseas airlines. 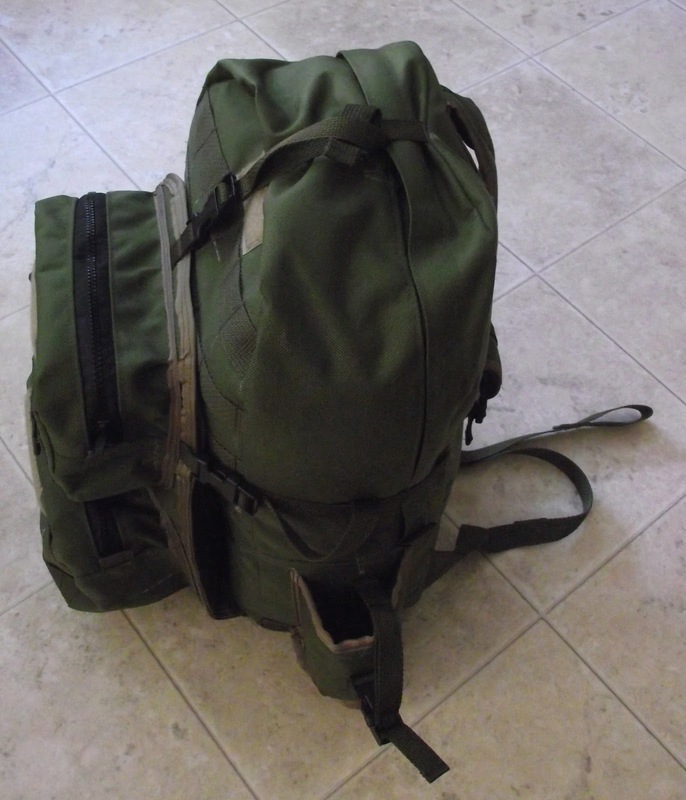 The bag had to carry and protect field gear that would be to difficult to protect as checked luggage; such as, cellphone, solar panel, and camera. 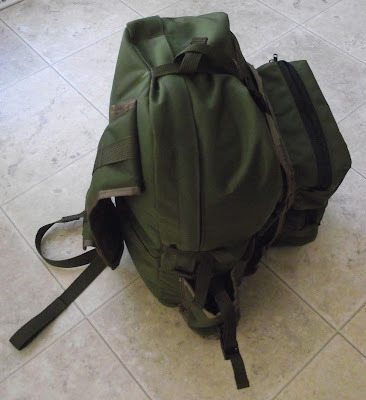 In addition, a certain amount of living gear needed to be carried in the case that the checked luggage was delayed. Thus, the mess kit, kfs (knife, fork, spoon) pouch. 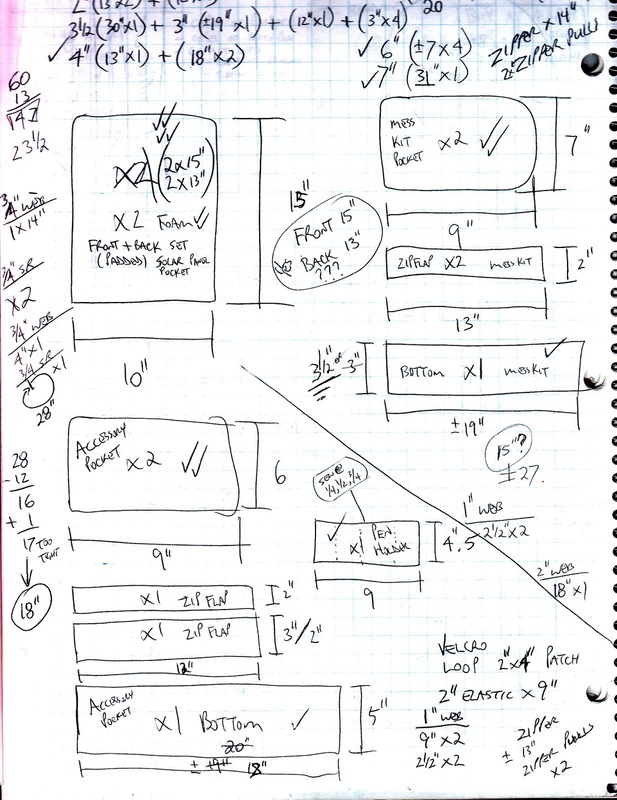 As with most of my designs I begin by sketching a rough drawing of the finished product. 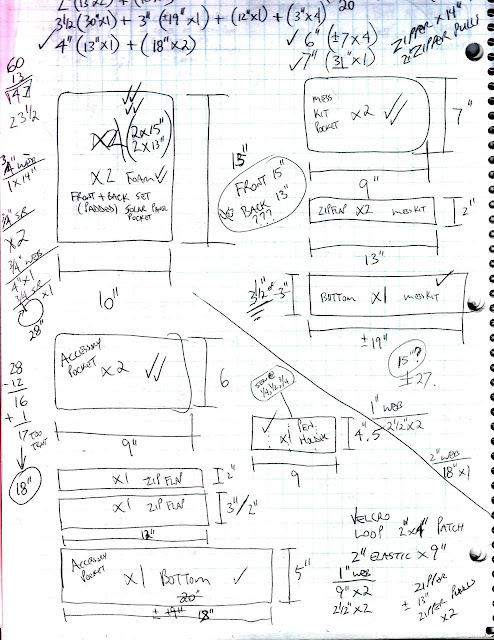 Then I determine the dimensions. Then I make the pattern pieces and then transfer the measurements onto the fabric using rulers & carpenter's square & tailor chalk. 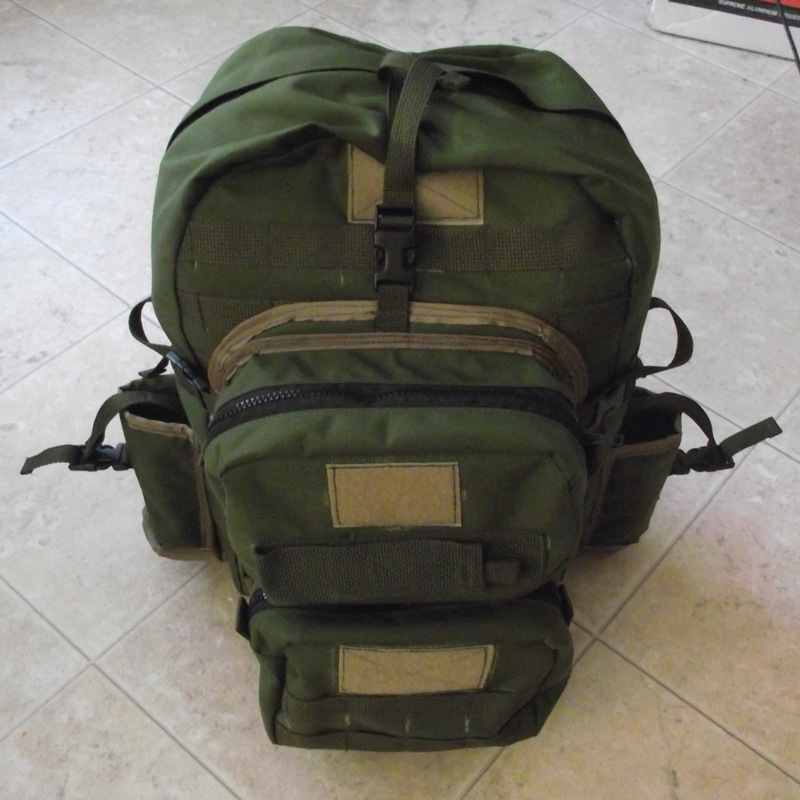 This pack used a little over 1.5 meters of Cordura Pack Cloth. It has been a good design in that there has been very little leftover scraps. 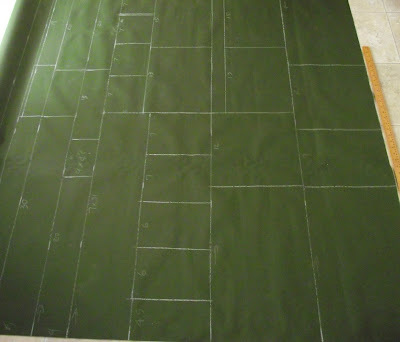 Once I have chalked all the pieces onto the fabric, I re-check the pattern and confirm I have all the parts needed, thus the little check marks on the pattern. 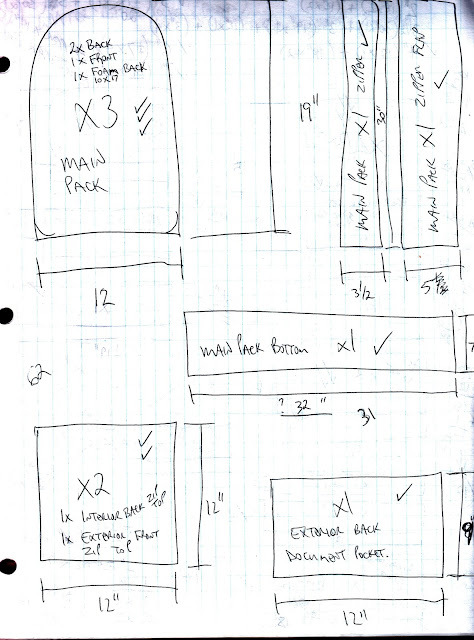 As this is a working proto-type, I make notes on the pattern, in case I make another pack of the same design - so, future packs are built quicker. 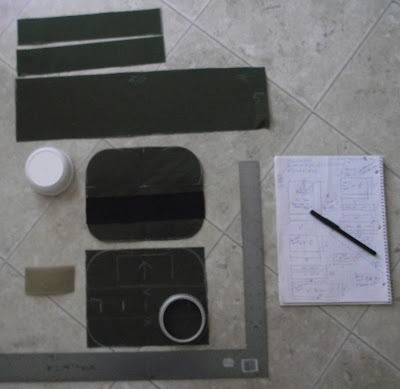 Design as you go is not the fastest method, but it does allow me to build packs that fits the gear I have to go in them. I have now made enough packs, gear bags or gear vests to know what will work for seam allowances or how long to make zippers so you can get your gear in & out, but if you are designing your first project it may take a few tries before it works properly. The next step is to cutout all the pieces and group them together by part of the pack. The first group I tackled was the sling strap. 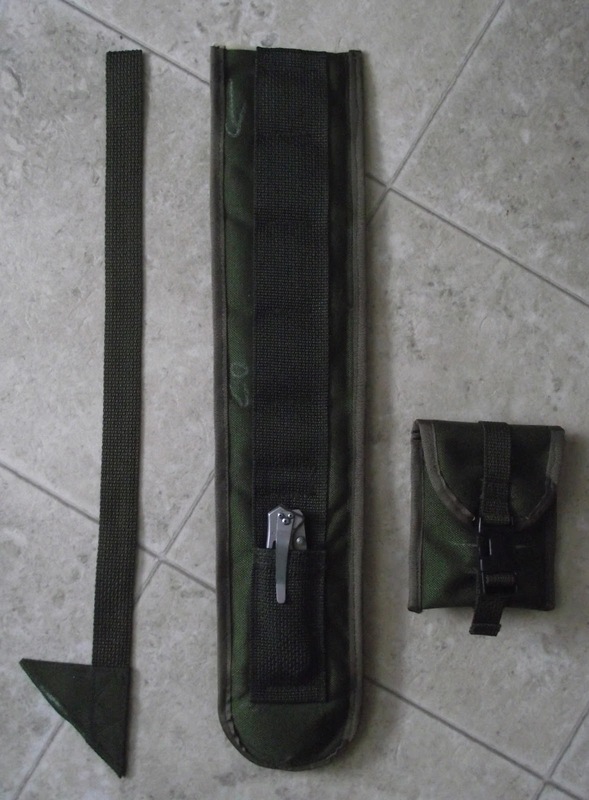 It is pretty straight forward, a wide strap with 1/4" foam padding, seam tape finish and a pouch for a pocket knife on the underside and a cell phone pocket on the outerside. The webbing strap is sewn through both top & bottom fabric and the foam padding. 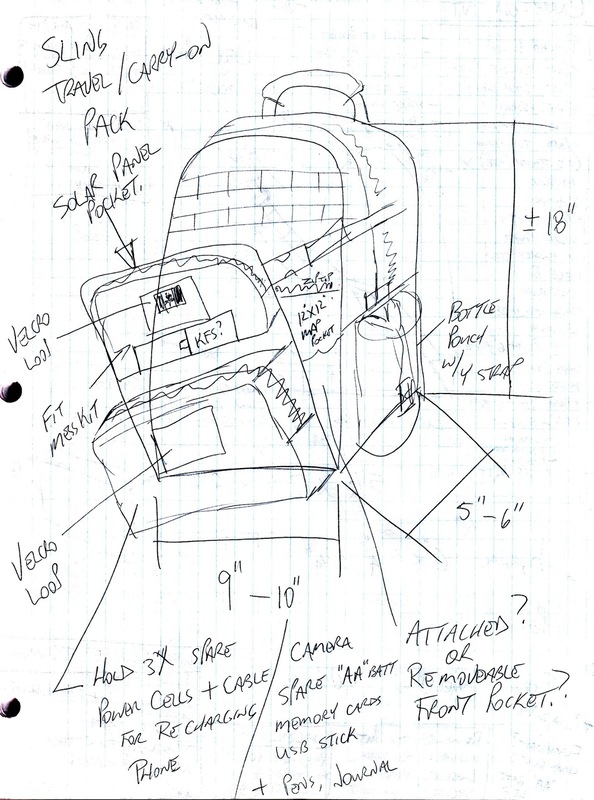 In a worse-case scenario the webbing strap alone will support this sling pack. The "d" ring on the sling strap will keep your keys handy if you use a carabiner on your keychain. The cell phone pocket will be top stitched in place once we are sure where it will be mounted - inverted on the topend or standard mounted at the lower-end of the sling strap. 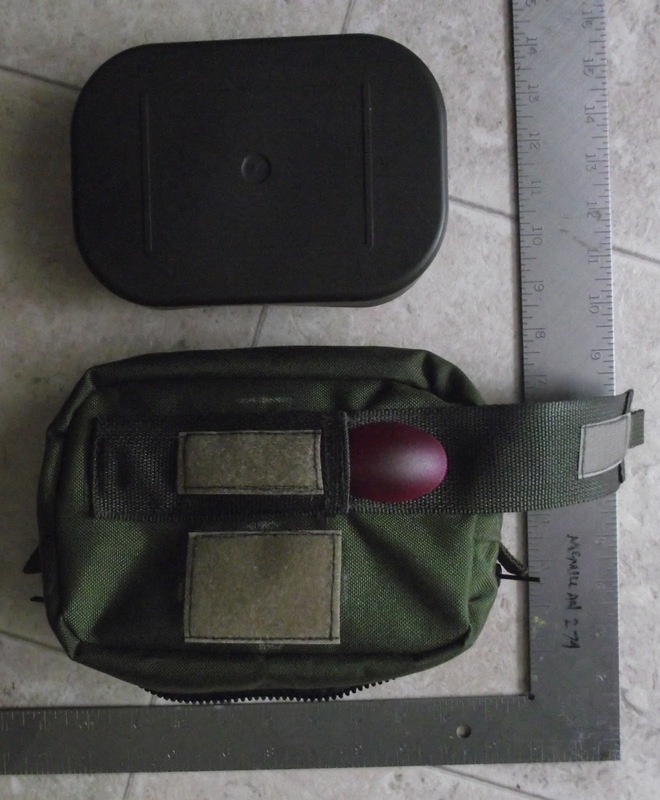 The next weekend I took on building the front pocket assembly, which included a mess kit pocket, power bank & pen pocket - both of which mounted on the outside of the front pocket. Inside the front pocket is a padded storage area for a Goal Zero Nomad 7 solar panel. 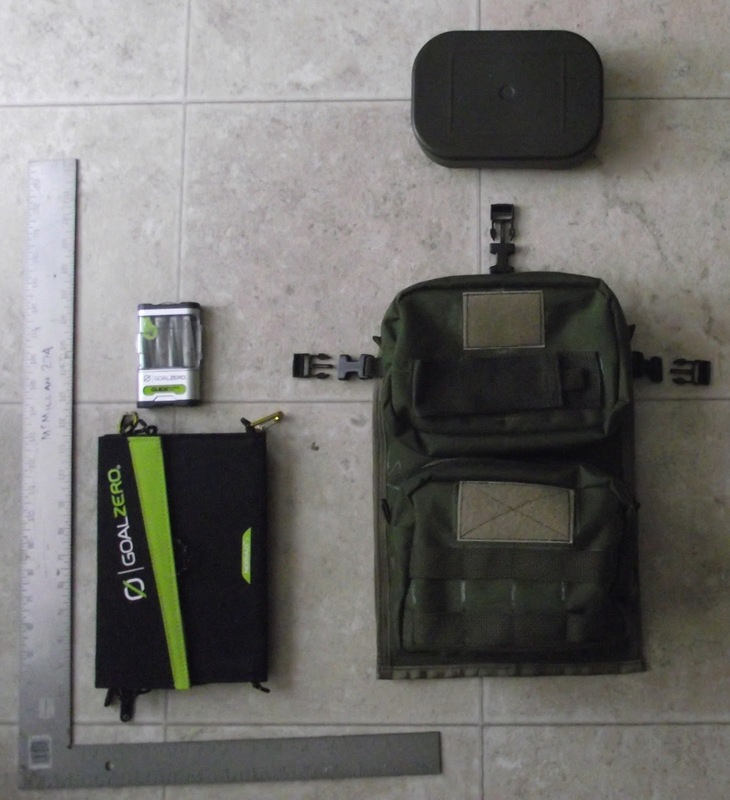 On the back of the front pocket is a pouch to store a Goal Zero Guide 10+ recharger unit. To the right you can see how the pieces are laid out. Tailor chalk is used a lot to mark location and to guide spacing for bartacking webbing. I have a number of common lids to help create rounded corners of different radii. 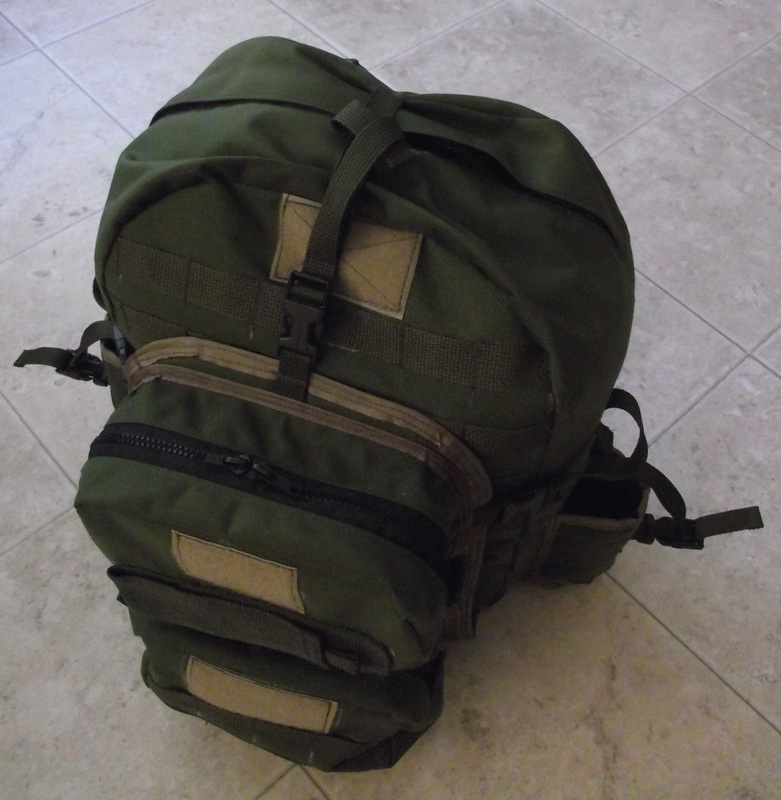 To the left is the finished Mess Kit Pocket. Oops, the image is upside down. I gues that doesn't matter for the time being. The mess kit was purchased from Sportsman's Guide dot com. It is compact, tough and light enough for this mission. The KFS pouch will hold a Spork or most knife, fork, spoon combo's. Because, interactions with TSA is expected this pouch will only have a plastic version carried. Once at destination the metal KFS will be taken out of the checked luggage. The bottom picture shows the completed front pocket. Look the mess kit pocket is mounted upside right. 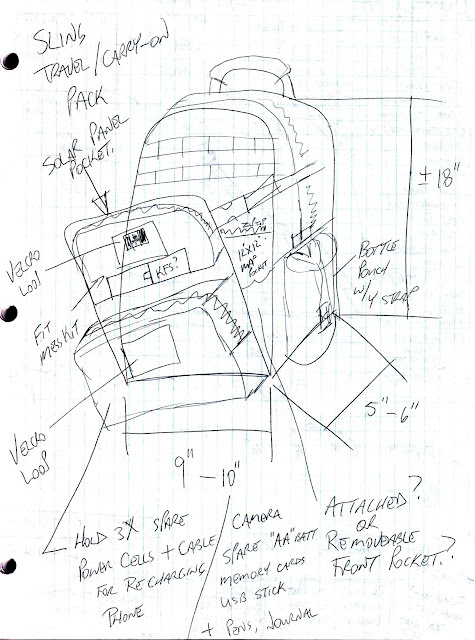 The front pocket assembly will be sewn at the bottom to the main pack and will have 3 compression straps to secure the top portion of the front pocket to the main pack, as well as, allow the space between the front pocket and the main pack to house a windbreaker or sweater when out sight-seeing. I will post again when the main pack is built. Until next time.......go build some gear!! !